Green Building is an approach to construction that can be applied to public and commercial buildings as well as the houses we live in. It guides every step of design and construction, from choosing a building site to installing a heating system. Green Building is alternately described as “sustainable” building. The ultimate goal of a sustainable building is to minimize environmental impact, maximize economic well-being, and promote social health to communities and people that inhabit them, while providing beauty, comfort and performance. Energy Efficiency The house uses as little energy as possible. Whenever feasible, renewable forms of energy should be adopted. Conservation of Natural Resources This objective recognizes that our resources are finite and should be used thoughtfully. Seen through this lens, durability, low environmental impact and low maintenance all become important attributes for a house. High Indoor Air Quality Green houses are designed to be healthy houses. Moisture, mold, and radon don’t plague a green home. Building materials, furnishings, paints and finishes should not contribute toxins and irritants to indoor air quality. More, specifically, a product is Green if is Avoids Toxic or Other Emissions or Contributes to a Safe, Healthy Building Environment. home is truly living green. approved by ANSI as an American National Standard. Their stringent third-party verified certification focuses on three primary attributes that are highly marketable to today’s discerning consumers. Their Green Certified Residences provide, Healthy Environments, Real Efficiencies and Sustainable Lifestyles. Coeur d’Alene Wood is NGBS Green Certified under the Healthy Environments and Indoor Air Quality Practices 601.7. 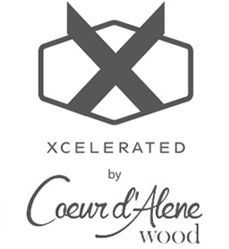 Coeur d’Alene Wood’s Xcelerated product line does not need any added paints or stains to be applied on-site, and, thus, the National Green Building Standard has approved up to 12 ‘Green’ points for using our material. Leadership in Energy & Environmental Design (LEED) is an internationally recognized green building certification system providing third-party verification that a building or community was designed and built using strategies aimed at improving performance across specific metrics. It encourages & accelerates global adoption of sustainable green building practices through the creation and implementation of universally understood & accepted tools and performance criteria. Developed by the U.S. Green Building Council (USGBC), LEED provides building owners and operators a concise framework for identifying and implementing practical and measurable green building design, construction, operations and maintenance solutions. LEED is used by architects, real estate professionals, facility managers, engineers, construction managers, as well as state and local governments across the country to help transform the building environment to one of sustainability. The LEED rating systems are voluntary, consensus based, and market driven. Based upon existing & proven technology, they evaluate environmental performance from a whole building perspective over a buildings life cycle, providing a definitive standard for what constitutes a green building in design, construction and operation. The LEED rating systems are designed for rating new and existing commercial, institutional, and residential buildings. LEED for Homes promotes the design and construction of high-performance green homes. A green home uses less energy, water and natural resources; creates less waste; and is healthier and more comfortable for the occupants. Benefits of a LEED home include lower energy and water bills; reduced greenhouse gas emissions; and less exposure to mold, mildew and other indoor toxins. The LEED for Homes Rating System measures the overall performance of a home, including Indoor Environmental Quality. 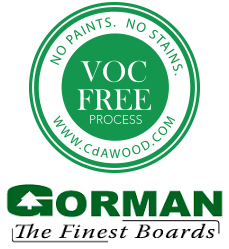 Coeur d’Alene Wood improves indoor air quality by reducing the creation & exposure to pollutants. The LEED Program offers up to 21 points for this category.